Its cute anyway, and for $39 a pretty good deal. Although you can hardly see it on the white wall (in person you can)...Henry thinks we should have got the wood coloured one...maybe he was right, but I hate wood. Ikea finally got the red chair in store. However when we got there they had sold out of the base!!! Luckily Henry spotted an abandoned trolley near the busy checkouts with the base in it. We watched to see if anyone went to claim the trolley but no one did for 3 minutes so we grabbed the base. Lol. I think the trolley was left there when the people saw the crazy busy check outs. It was 5:30pm on a Saturday, the busiest time for Ikea I believe. The chair was only $35 and its super comfy. Its a bit different to my old one, I think they re-designed it. Its more sturdy and comfy now. Oh and I got a new mouse. I don't like doing design work with a laptop mouse. This one was only $19.95 from Officeworks. I was a little surprised when I plugged it in and it started flashing colours like crazy. It didn't say it was going to do that on the box! It's my crazy disco mouse. Hi Hayley! I just came across your blog, I love it! It would seem we have the same desk - is it from Ikea? What a bargain! 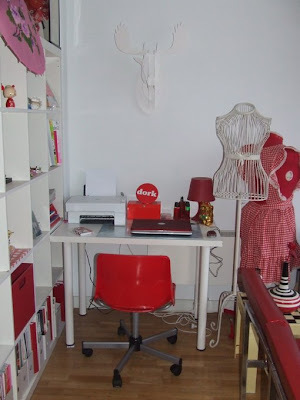 I am loving my new desk set up - I'll be posting pics soon to my blog. 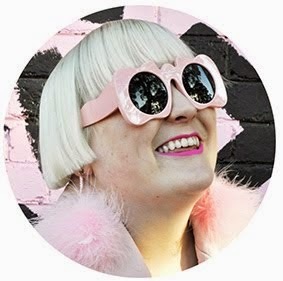 Hope it's OK if I add your blog to my list of faves? Hey Stephanie. Thanx for the love. Thanks for you comment, I love your work area.. I almost got that red chair too! 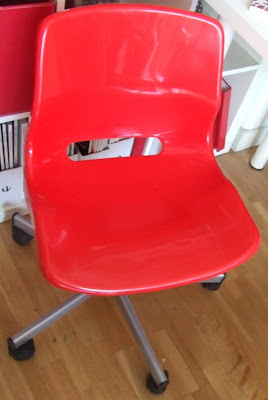 My husband thought I was nuts though to want a hard chair, so we ended up with the padded red one you saw on my blog. 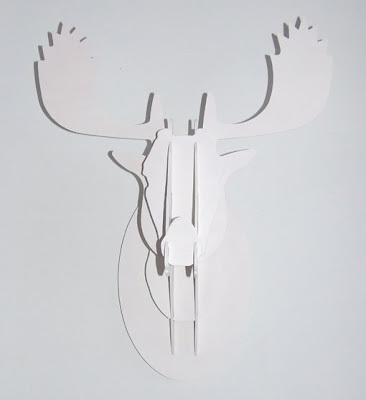 The moosehead is fabulous too! and yeah the hard chair is a little uncomfortable yeah...I might get a cushion or something for it.